If you’re like many pet owners, finding the perfect Halloween costume for your pet is almost more exciting than finding your own. Seeing your dachshund dressed as a hot dog or your kitten prancing around in a super-man cape can add even more fun to the holiday. Just keep in mind that while a costume can be cute and funny to you, your pet may not agree. 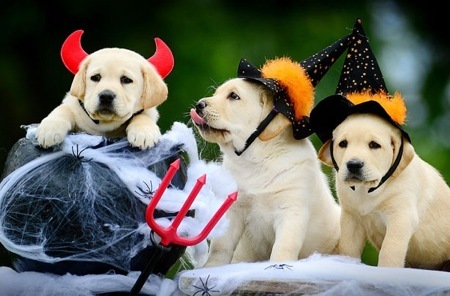 “In general, tolerance of costumes is pet dependent,” said Dr. Stacy Eckman, clinical assistant professor at the Texas A&M College of Veterinary Medicine & Biomedical Sciences. “Some pets will tolerate them, and others will not.” If Fido appears indifferent towards being dressed as a giant spider or pumpkin, then suit him up. However, there are still a few safety guidelines to consider when choosing the perfect costume. “Make sure that the costumes do not obscure their vision, do not block their nose or mouth so they cannot breathe, and that they do not trip over them,” said Dr. Eckman. “Avoid anything that encircles the head or neck or that blocks their nose and mouth.” Any attachments that they can rip off and swallow, such as extra limbs or bones, can also be hazardous. Fur-safe sprays are generally okay to use for changing the fur color, as long as they are not applied too close to their eyes. Make sure that the spray is designed specifically for animal fur and that you carefully check the labels for any discrepancies. It is smart to put the costume on a few times prior to the holiday to see how your pets react to being in it. If they are uncomfortable, it should be easy to tell. As long as your pet is comfortable in a costume, dressing them up can be fun for the whole family.